Today’s Cute Outfit Ideas is dedicated to the ever-so-popular Denim Jacket. It’s everywhere isn’t it? I just purchased one today in fact. I was also mourning the loss of a denim jacket I bought while living in Europe as a young 18 and 19 year old. I was telling my husband (who was completely listening) how I so wished I still had that jacket and that I can’t believe I got rid of it. Horrible story, I know. What’s so great about a denim jacket you might ask? EVERYTHING. Everything is a great about it because you can wear it with – just about – everything. And I’m going to show you! Check out these cute outfit ideas. 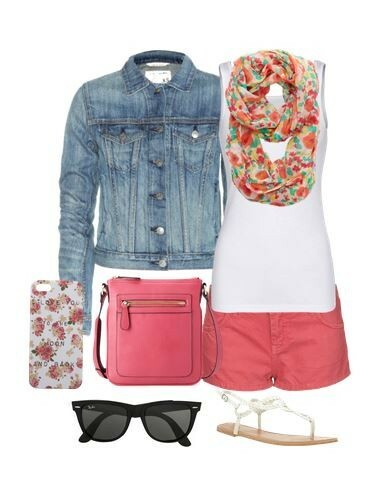 This first outfit is a jean jacket paired with pink shorts, a simple white tank, floral scarf and sandals. The jacket is perfect for this because it adds color and when those spring nights get cool – voila!, a jacket to keep you warm. I love me a good maxi dress and I especially love one paired with a jean jacket! How cute does this look? Imagine wearing this shopping with the girls or out on a date with that special someone. This would even be perfect for dinner out after a long day soaking up those sun’s rays at the beach. I love this feminine look! The denim jacket tones down the feminine touch just a bit and gives it a pop of color at the same time. You can pull a color from the skirt and add a scarf for those chilly spring days. How do you feel about white on white? Too much? If you break it up with a denim jacket you have one fantastic outfit. I would wear this to a casual dinner or a casual business meeting. Or just because. Shop more denim jackets below. Which Cute Outfit Ideas featuring a denim jacket was your favorite? Let me know in the comments! Where is the iphone case from in the first image?? I love it!